Soundscape / Acoustic approaches for The Common Line. Trees play their part in the constitution of the acoustic environment. They are noise generators, passive absorbers (albeit limited) and can form a noise barrier. They have soundscape and acoustical consequences (acoustic canopy of the tree). They attract birds, squirrels, beetles… They are a meteorological indicator – wind through foliage will generate species specific white/ grey/ Brownian /pink noise. Rain drops on leaves are another source of noise – consider combination of wind on foliage and rain on leaves – remembering Peter Ablinger’s Das Arboretum Seitelschlag (tree plantations according to acoustic criterias as, e.g., colour and intensity of noise, version Seitelschlag, Ulrichsberg, Austria, Date Planted: April 8th, 2008). Also creaking of trunk or branches on branches in a storm. I made a great recording from a wood in Dartmoor (from Sounding Dartmoor project) in a storm – the trees are singing, lots of variation but with a clear individual voice. Should I develop a compendium of tree species foliage noise? How close up should the microphone be – individual leaf / or combination. Of course seasonally dependant – deciduous / coniferous. Reminded of other tree works, David Dunn and listening to internal sounds of trees. I appreciate these work but more invasive / auscultatory approaches, doesn’t feel right for this project, as we do not have this kind of everyday experience of trees on the human scale. contextual factors – crepuscular, seasonal, migratory birds, you will not find more than one male Robin on the same tree – importance of song post, distance and acoustics (interplay of acoustic arena / acoustic horizon). Collecting of various contrasting dawn choruses. An isolated tree is of course vastly different from a wood, forest vis a vis dawn chorus. Plant a tree and the birds will follow. Once we started working with augmented reality the ideas have moved on. Field recordings are potentially too literal, perhaps a cliché, and do not shift the imagination. Out of kilter with the reduced and idiographic hand draw images. Follow up with workshop with 8/9 year old school kids. They drew trees and then generated with their voices and paper, sounds representing association of trees and what was represented in their pictures, squirrels, birds, leaves, and more abstracted ideas such as the tree sucking up water though its roots. The children were very receptive. One voice first and then the other kids copied that voice. Everyone had a turn. Not possible to make a mistake, all sounds valid. They were quite used to the idea of drawing tree but making tree sounds was very exciting for them. They immediately grasped the idea. The fluffy microphone helped. Meanwhile, I have been experimenting with the field recordings, subtle transformations to shift them into a more abstracted zone / less literal and more musical perhaps. 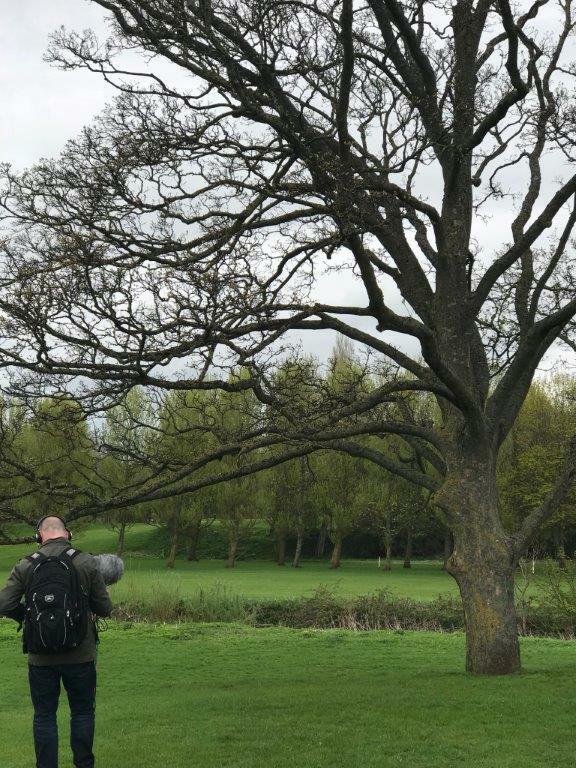 In the field work then we have been trying out a combination of sounds for the tree: straight field recordings made around trees often including bird song, transformed field recordings and tree sounds generated by kids, and a combination of all three. I have also developed a line sound, which has a buzz of sparking and fluctuating energy – current traveling in a loop on the line throughout the whole length of the line and back (spoken work could be added to this in the future). This sound has been generated by treating electromagnetic recordings of electric London busses – fascinating interlocking patterns and glissandi. The augmented reality experience at Goldsmiths was quite successful. We began to explore the spatial aspects of Unity. You can walk towards the line and orientate yourself to it. If you stand perpendicular on the line, the sounds of the line will cut through you from left to right / right to left. If you face in the direction of the line, it cuts through your back to front/ front to back – this is much harder to perceive aurally. We generated localised acoustics of the tree sounds. If you step back the sounds gets quieter and muddier / reverberant. Or as you move towards the tree you get greater clarity. Unfortunately, when we tried this out on the actual line in Hounslow, there seems to be a number of technical problems. Tree sounds were being triggered, and layered, but not with the level of precision or control as experience in Goldsmiths on a demo line and acoustic cues lost. Certainly the potential is there for it to work in a powerful way, and sounds on headphones really helps with the immersive / 3D perception of potential trees.